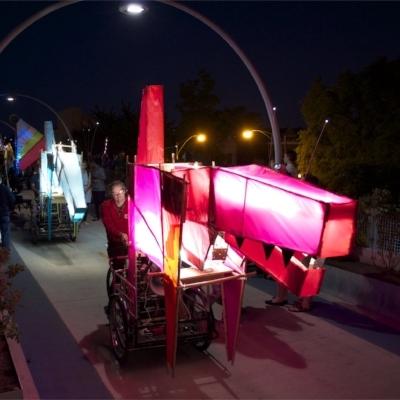 A pack of three illuminated “Chomper” bikes will rove throughout the BLINK event. Opera-Matic is an arts organization focused on building community resilience through creative play. We do this in order to amplify a community voice, to lift up shared resources, and to model participation in social change. Our vision is that people everywhere will find and create, in their own neighborhoods, opportunities for joyful civic engagement.